Hi, Thank you, friends and viewers. Today I will post how to make gajar ka halwa recipe. Gajar ka halwa is the season's best sweet made as new year special at my home. Gajar means Carrot in Hindi. We get a good carrot in this season, red gajar or carrot is a special vegetable available in the winter. Gajar ka halwa made with red carrot, of course we can use regular carrot also, but red carrot has sweeter than the regular one and also nice tempting color. Every December 31st I prepare this sweet and distribute among friends and neighbors. To get the rich taste we use khoya/kowa/mawa instead of milk, but we can use whole milk also. Now coming to the recipe, I prefer to use a hand grater for grating carrot, instead of mixer grinder or food processor. We need to saute the carrot till we get the nice aroma of it, otherwise, the raw smell will be there. Do not add more sugar as the carrot have some sweetness in it and adding milk or mawa gives sweetness, so take care not to add more sugar. Carrot Halwa Recipe -- Pudding made with Carrot or Red Carrot. Wash, peel and grate red carrots or carrots using hand grater. Heat ghee in a thick bottomed vessel or Kadai, saute the carrot till the rawness goes off. By this way itself the carrot gets cooked. Add milk, if using mawa add it here. Let it cook for 10 to 15 minutes. By this time, if using milk it gets thicken or if using mawa it mixes with carrot well. Add sugar and cook for 10 mins or till the sugar melts. In another kadai, add ghee and fry cashew nuts and raisins till they turn golden colour. Keep them aside. Once the carrot cooks and the milk or mawa added gets cooked add cardamom powder. Give a nice mix. Add the fried cashew nuts and raisins aslo. Mix well. 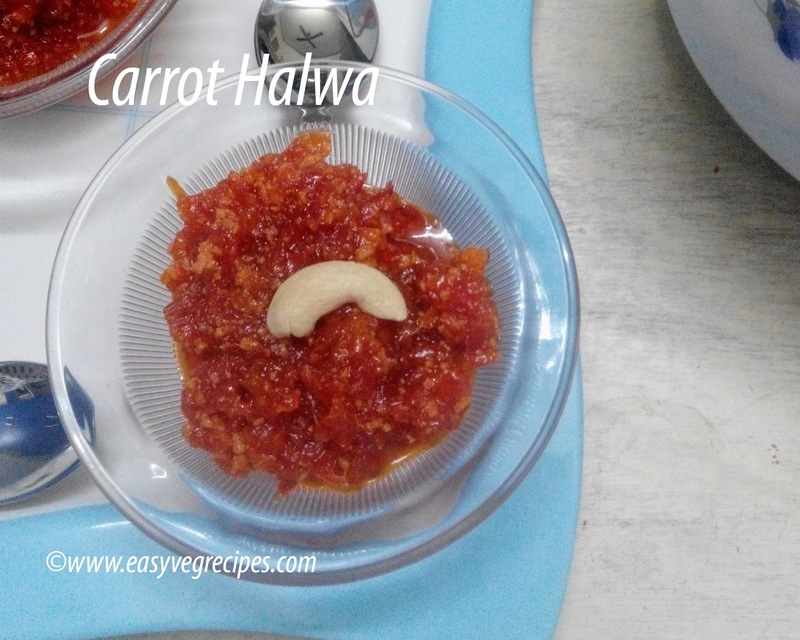 Serve carrot halwa hot or warm during any occasion. Thank you for visiting my blog. Hope you like all my recipes. Feedback and suggestions are welcomed in the comment box. For more sweets click here. Feel free to mail me: sailajaangara@gmail.com OR eat@easyvegrecipes.com.